Guide Ethan Black as he attempts to rescue his bride-to-be from a terrifying menace known as the Faceless Ones in Dark Strokes: Sins of the Fathers! When Evil comes for the people you love, what will you do? That moment of reckoning has arrived for Ethan Black and he needs your help! Guide Ethan in this Hidden Object Puzzle Adventure game as he explores a decimated city, searches for clues, and peels back the layers of a chilling supernatural mystery in Dark Strokes: Sins of the Fathers! Dark Strokes: Sins of the Father Collector's Edition is rated 4.6 out of 5 by 203. Rated 5 out of 5 by canadiangirl94 from A dark past finally catches up Ethan and Claire are on their way to see his father when their train crashes and Claire is taken away by a group called the Faceless Ones. As you try to find her, you discover a secret that could make you lose both her and your father forever. Is it a secret that will make you question everything you ever thought you knew about them or are they just victims of an unfortunate circumstance. Who is responsible and and what has driven them to take such great lengths to get revenge? The bonus story is great in understanding how the one character became the person they are and although it isn't necessary it is great for some extra content. Rated 5 out of 5 by vampirephantom from Exquisite! I enjoyed every single second of it.Simply amazing and complex! Rated 5 out of 5 by papillion727 from Excellent storyline! 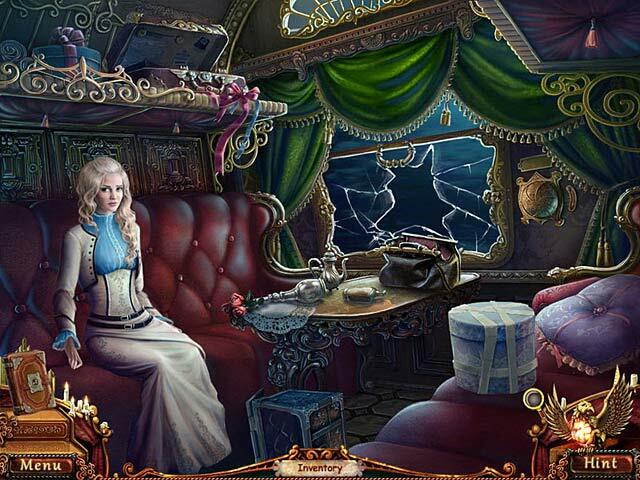 The game develops a story that keeps you puzzled until the end. Many puzzles, more HOGs than I personally prefer and the HOGS get more difficult toward the end. I thought the cut scenes were well done. Rated 5 out of 5 by SuperOmmi from Loved It! ... How did I miss this one? I have no idea how I missed this one when it came out, but I came across it this past week and since I have the newer Dark Strokes, I decided to play. No regrets, it was great. Graphics, music, game-play, level of challenge, voiceovers were all excellent. The story was different and held together right to the very end. This being a somewhat older game (2012) means that there are no cute helpers (please can we stop with the helpers), you can't lock the inventory, the map isn't jumpable, and there are no extra collectibles or achievements. But I don't mind all that because the game play is smooth and there is a nice, related Bonus Game. The Bonus Game is a prequel telling the story of how the bad guy went bad and fills in a couple of plot holes from the main game. I miss the days of the long 4-5 chapters Bonus Games - because that's what the CE should be about - more of the gameplay you love, enough to warrant paying twice the price (remember the old Echoes of the Past? ), not a bunch of meaningless bling that most people don't really care about. I play CEs for the Bonus Game - which in the last few years has dwindled down to just a couple of Chapters. Well this one has a nice BC as well so I was very happy with it. Rated 5 out of 5 by pennmom36 from Dark Strokes: Sins of the Father CE Ethan Blake has just received an urgent message from his father, Judge Blake, insisting he postpone his wedding to Clair and come to Cedar Falls immediately! Something or someone doesn't want to see them arrive in Cedar Falls, a faceless demon causes the train to derail nearly killing both of them! They quickly resort to plan B traveling on an abandoned ski lift, this also turns out disastrous when they arrive, this same phantom whisks up Clair and quickly disappears into the night! The whole town has been living in fear from these faceless demons who are responsible for the disappearances of many citizens including the love of your life, what has your father done to anger this phantom who seeks revenge? This is a fantastic game with plenty of activities to do in every scene. 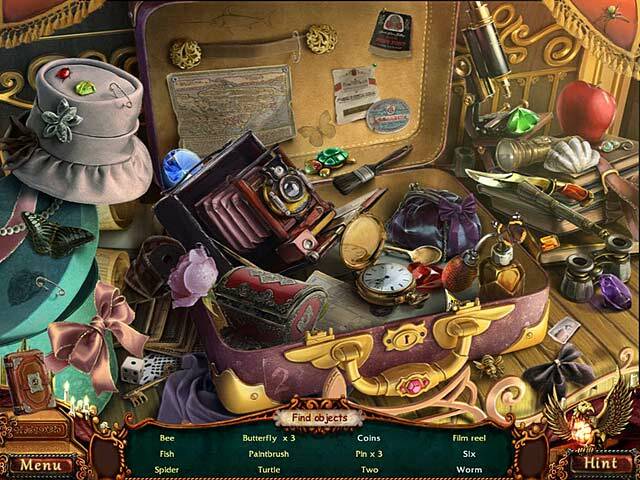 The Hidden Object Scenes are slightly interactive list finds where you might be required to find a key and use that key on the cash register drawer to expose the money, or turn a die several times until the number 6 shows up. The mini games are creative although nothing new such as flipping tokens over two at a time until you find two tokens that correspond to each other such as a foot and a hand. there are also tasks such as clicking and dragging miscellaneous items out of the way until you find a pair of scissors. In my opinion there isn't enough backbone in this edition to make it a worthy Collectors Edition. there are wallpapers, concept art, and a built in strategy guide as well as 4 bonus chapters that take you back to the beginnings of the phantoms life. Nothing else, no collectibles, achievements or morphing objects. The story however is still excellent in either edition. The only complaints I have are a couple of misspelled words in the journal and a map that is worthless because it simply shows a red dot stating "you are here" enjoy! Rated 5 out of 5 by Italia47 from Outstanding game! A must buy! 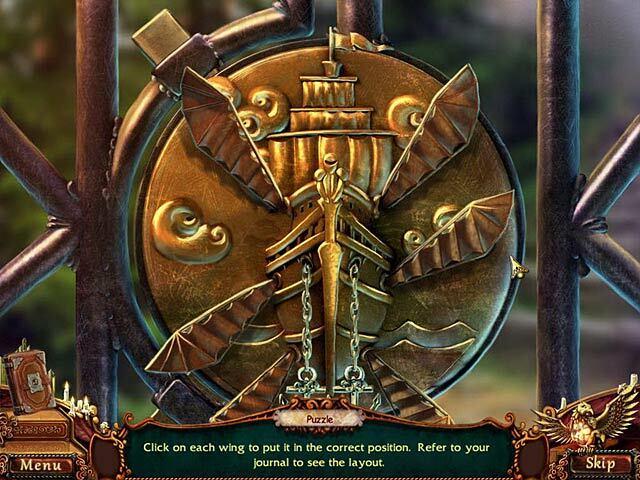 A well-balanced CE game, storyline great; the game flowed, puzzles great, even with the bonus game, I hated it to end! Buy this game! It's one of my favorites! I highly recommend it! Rated 5 out of 5 by mrm2006 from Excellent The storyline is basically son takes fiancee to see dad at his request but she gets kidnapped by one of the "faceless ones". Then he finds out that his father and Claire are somehow involved in why this revenge is being brought upon them. The graphics are amazing, voiceovers and cut scenes great. HOGs not difficult - neither are the mini-games. The hint button takes a minute or so to recharge so use wisely. I try to play the SE and CE free trials to compare and didn't use the strategy guide at all. However, after reading reviews for the CE (which I also do) I will definitely get the CE for the bonus gameplay - not the strategy guide. I didn't want this game to stop but, unfortunately, have to wait for my next credit so I can get it - on a limited income - boohoo. But, this Glam-Ma says you HAVE to try the free trial - you won't be disappointed! Rated 5 out of 5 by SchoolMom from Surprises from the Depth of a Soul Dark Strokes: Sins of the Father Collector's Edition is a fabulous story of love and intrigue. Claire and Ethan are engaged and on their way to the altar however, their trip to the altar differs beyond their wildest imaginations. Dark Strokes: Sins of the Father flowed similar to a good romantic, suspense novel. The graphics are superb, realistic dialogue, plenty of action. I appreciate the designers choice not to do voice overs. When the characters are lip-synching and it doesn't match in timing it distracts me. It is annoying to watch. I must say that the storyline, characters and hit all the elements that held my attention. So much so that I rushed home from work to hop on the computer to play the game. No working late as usual!! :-) Shocking to my colleagues : -> I loved this game!! I will eagerly look for more games by the creators/ developers of Dark Strokes: Sins of the Father and hope the others are as well-done. I highly recommend it!!! I selected this game based on Rebr20009 review and the video! Rated 5 out of 5 by neilskinut from great game Boy this is one you will not want to stop. Graphs are great and music is not overwhelming. The HO are not hard and the puzzles are somewhat easy. Some going back and forth but you know where to go. Map is worthless. Hint button works well to keep you going if you have problems. Guide Ethan Black as he attempts to rescue his bride-to-be from a terrifying menace known as the Faceless Ones!